The Daily Chow: UFC - MGM Grand Meet and Greet! UFC - MGM Grand Meet and Greet! I think I've mentioned how back blogged I am! I still have pictures, antics and reviews to post for my past holiday travels, but one bit at a time. Atleast I'll have material for some time to come. 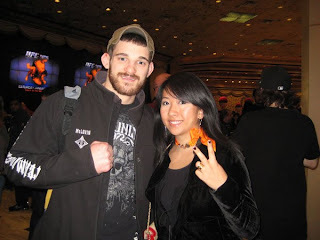 One of the highlights of Vegas was the UFC meet and greet at the MGM lobby. As packed as it was, it was still pretty easy to move around and see some of the fighters for that week's card, like Rashad Evans, Dustin Hazelett and Mr. UFC Prez himself Dana White. There was a horde of camera people, press, crazed fans and more. I was shocked at the people that were SCREAMING for Dana White, especially the lady displayed at the top. One thing I'll give Dana White, despite how some of the media portray him or what people say about how arrogant he is, the guy is actually nice and really good to his fans. Most "celebs" would just take a couple pictures, run through and get his press in. 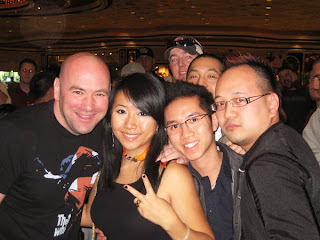 Dana White actually took the time to talk to us, answer some questions and take pictures. While people were waiting for Dana and Rashad, Dustin Hazelett took time to go through the crowd and take more pictures and talk to more fans, genuine cool guy. Rashad Evans however, once he got to the end, he took off (kinda expected). I was hoping that UFC 108's card would be a lot better, but a lot of the big hitters are either injured or ill. I was routing for Thiago Silva too. So just as a thanks, I tweeted a photo and a thank you message to Dana White for actually taking the time to chat with us and much to my surprised he replied! I'm not one to get star struck or go bat $hit crazy over any celeb contact, but more-so I'm blown away when busy media folks, actually take the time to reply and really seem approachable. I thought that was pretty cool. Another celeb that I had a short tweet session with was Aubrey O'Day, I've actually met her in person when she hosted a part at the IVY hotel down here, and she's another really cool person. The media portrays her as this stuck up skank, but she's pretty easy to talk to and doesn't brush people aside. I'm looking forward to tonight's Fight Night on Spike TV, so here's some more pix from the UFC meet and greet.